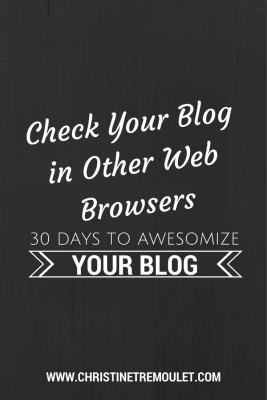 Check your blog in other web browsers! 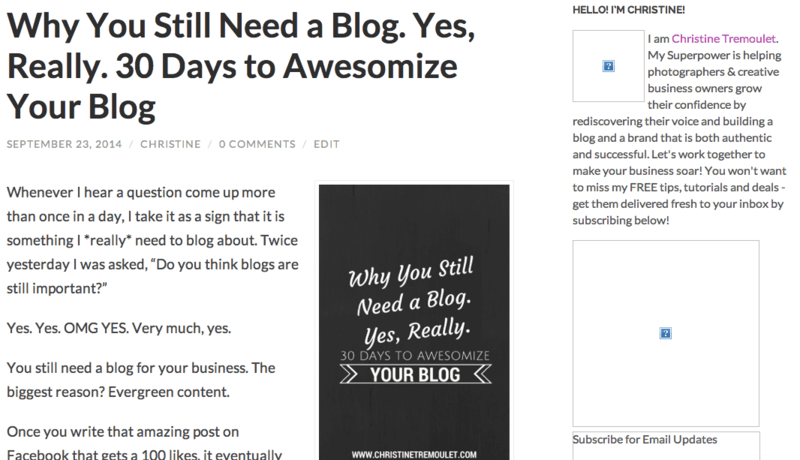 I redesigned my blog in mid-September, and I merged the Business of Awesome blog in with my current one. Lots of content moved around in to new places, but when all was said and done I was looking at a lovely site with everything in its place. Turns out that everything was in its place … if you were using Google Chrome. Using Safari? The top three graphics in my sidebar were missing. The day after I did the launch, my friend C.C. mentioned to me that the graphics were missing, but I thought it was just a loading issue on his end. After all, I could see them. It never occurred to me to ask him what web browser he was using. Or to check some other browsers myself. You would think I learned from the last time when I had not clicked all the buttons to test things on my site. Turns out, the lesson still needed some reinforcement! I’m grateful that my friends are looking out for me, but I feel right now like the woman walking around with her skirt tucked in the back of her underwear. Whoops! Check your blog in other web browsers. Try it on every browser you can get your hands on. Chrome, Safari, Firefox, Internet Explorer. Mac & PC. iPhone, Android phone, Android tablets & iPad. Make sure you know what it looks like in every web browser. Save yourself from the embarrassment I’ve experienced today! 30 Days. You, me, and our blogs. Lets make them AWESOME! If you’re not on the email list already, make sure you subscribe so you don’t miss any updates! No, that is not embarrassing. Nope, not at all. Erin Patrice Bennett liked this on Facebook.